Make stretching more fun and enjoyable with these easy tips! When you first start a workout routine or commit yourself to a new goal, the first steps can feel like a struggle. To help you build momentum, here are a few tips to stoke the fun vibes. Stretching isn’t about sliding into splits with a serious scowl on your face (although we know that some stretches will inspire you to carry the concentration of an Olympic gymnast), it’s about having fun, celebrating your progress, and enjoying the time you’re dedicating to self-improvement and healthy living. When you’re taking a StretchIt class on your phone or streaming on your computer desktop, add some music to the background. Use your stereo or other device and pick a playlist that keeps you focused and inspired. Maybe you’re in the mood for a gentle morning wake-up with some smooth coffeehouse indie tunes or you’re ready to tackle your training with some killer hip hop hits. Whatever your preferences are, adding music to your stretching session can help you enjoy the experience—and distract you from those long active holds. Wear what you love! When your outfit makes you feel good, you’ll have more fun working out. Invest in something that you really love to stretch in, whether it’s a pair of cute leggings, comfy sweatpants, a fun top, or even a great pair of underwear! Get creative and wear something that makes you feel fabulous. 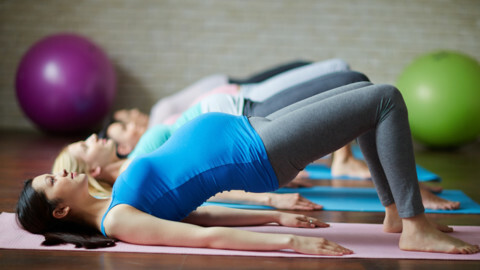 Each StretchIt class includes a warm up, training sequences, and a cool down. Your whole body will be awake after you complete a class, allowing for the perfect opportunity to try a skill after you’re finished. For instance, if you’re working on inversions, do a few handstands against a wall after completing a 30-minute middle split class. Or maybe you’re working towards your forearm stand. Give it a go! Other ideas for skills include: chest stand, standing needles/scales, or back bridges with one leg raised toward the sky. Make sure to stay safe and take it one step at a time—don’t jump to skills you haven’t properly prepared your body for. Stretch party at your place! Invite friends to join you for a class. Making it through the most challenging parts of a workout can be a great bonding experience with others. Support and cheer one another on. Plus, it’ll make the time fly by faster! Channel your inner Gisele or Gigi and get on camera! Another reason to stretch with friends: do a photoshoot after you’ve finished training. Take a walk in the park or another beautiful spot to find a scenic backdrop for showing off your bendy moves. From a Middle Splits Challenge to Bendy Back in 30 Days, StretchIt runs frequent stretching challenges to bring our community closer together and help everyone conquer their flexibility goals! Keep an eye on the Insta to join our next Challenge and see how far it can take you. Taking progress photos over time can help you track your progress and show you how far you’ve come. It’s fun to look back and see all that you’ve accomplished. Use an app or photo program on your phone to create a photo collage comparing your progress pics over time. 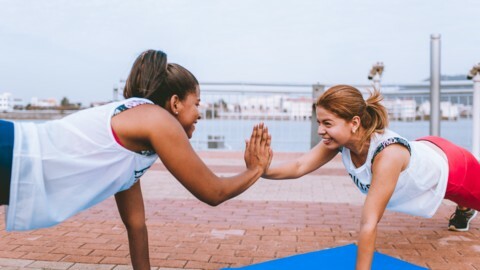 Sharing your progress over social media can help inspire other people to start their flexibility journey—it’s a great way to share the positivity and encourage others to go after their goals. Sometimes we are creatures of habit and default to the things we’re most comfortable with. Do you find yourself taking one class over and over again? We understand—you like it because it works! However, switching it up and stepping outside your comfort zone can be worth the risk. If you always take a Full Body class, challenge yourself with a Bendy Back class. Always wanted to try a Middle Split but find yourself sticking with the Extra Active Stretch classes? Change things up and try a new class! Just go for it. It may be challenging at first, but you’ll have fun when it’s over and you can thank yourself for having the courage to expand your comfort zone. Always stretch inside? Try taking your mat outdoors to a park, beach, or other safe natural area. Surrounding yourself with nature as you stretch can be quite a treat. Enjoy taking deep breaths of fresh air and pause to appreciate the beauty of the world around you. StretchIt is the perfect workout to take with you on your travels. It’s a workout you can really do anywhere—from a hotel room to a beachfront to a log cabin…wherever you may go! Download your favorite classes beforehand and they’ll be ready for you when you need to get your fitness on. Stretching while on vacation can make you feel great and help you have even more fun during your getaway.